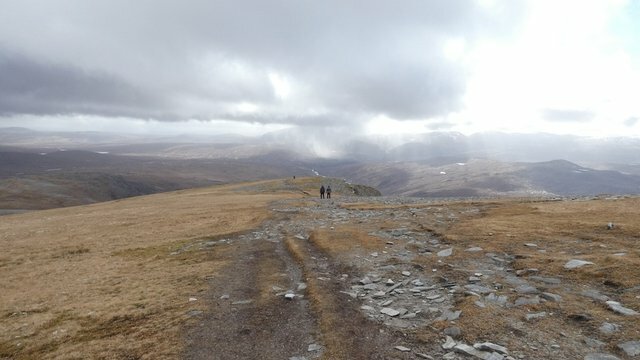 Saturday 23rd March was the day we were due to climb Ben Hope, the UK's most northerly Munro (mountain over 3,000 feet). Despite the high winds overnight, the forecast was for a much more moderate 25-35mph windspeed on the hills. Map showing the places we visited. Click here to view a larger version. I'd had quite a good sleep in my nice warm hotel bed, but it followed three consecutive nights of disturbed sleep and insomnia. I think I'd just been too excited about the trip. As a result, I could barely drag myself out of bed that morning. In addition, Sunny, the organiser of this event, had arrived at our hotel unexpectedly the night before, with her partner Iain. They had been camping at a different site, and they'd also decided that it wasn't really ideal camping weather. We'd enjoyed a few glasses of wine while watching the film Free Solo. 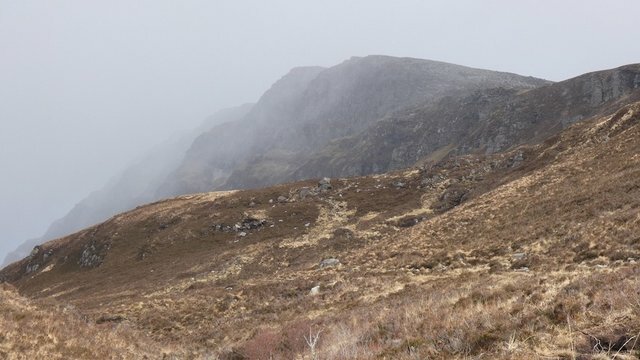 As we drove the 20 or so miles on single-track roads to the start of the walk, the views were at times so dramatic in the foreboding weather that I felt compelled to stop the car and take photos. Ominous clouds gathering over a silvery Ben Klibreck. By the time we reached the start of the walk, the weather seemed to be improving. Two people staying at a bunkhouse had joined us, so six of us headed up the hill. I don't know if it was the wine or the lack of sleep, but I was not my normal energetic self that day! I felt a bit sluggish at breakfast time. Usually when I feel like that, I come to life as soon as I get on the hill. The fresh air seems to give me a burst of energy. But this day was different. About 20 minutes into the walk, I started to feel fatigue and waves of nausea. I had to slow down, and I urged the others to go ahead, saying I would catch up. I had a map and compass. However they would not hear of it, and waited while I trudged along, stopping every few minutes for a rest. 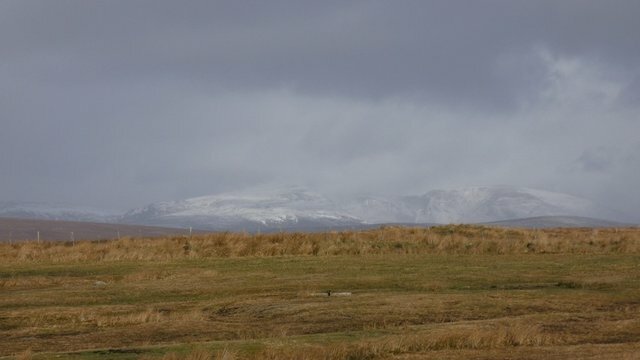 View up to the summit of Ben Hope. 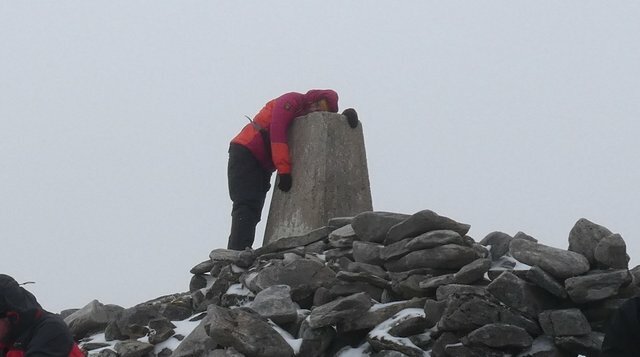 As we got closer to the summit, I started to feel better, and it was actually a real surprise when the summit trig point appeared. I hadn't expected to see it so soon – in fact at one point I'd felt so unwell that I wasn't sure if I'd see it at all! 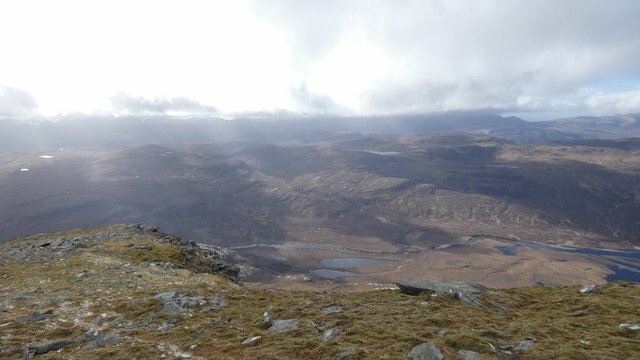 First glimpse of the summit of Ben Hope. 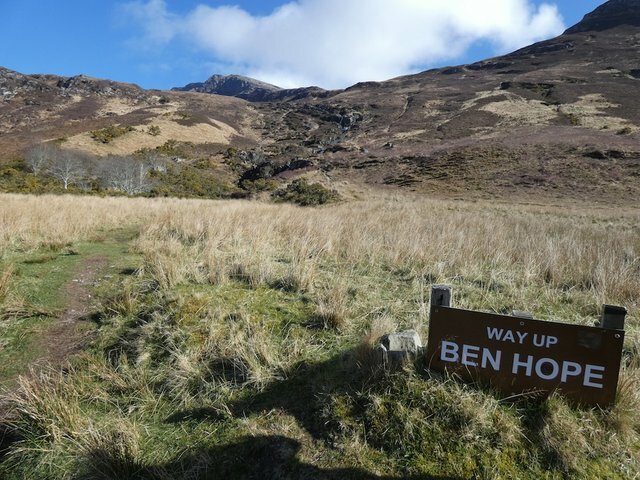 Ben Hope is generally considered to be one of the easier of Scotland's Munros. It's quite steep, but it has good paths, and there are no technical difficulties if you take the main route up. 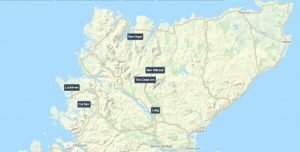 The two climbers who tragically died on Ben Hope a couple of months ago (mentioned in my earlier post) had been testing out a much more difficult winter climbing route on steeper ground. We held a small ceremony for them at the top, toasting them with single malt whisky, before having lunch. I felt much better by then, but I had no appetite for lunch. 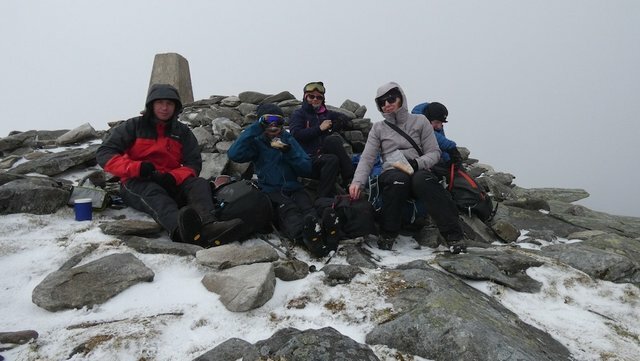 Lunch at the summit of Ben Hope. I was just happy to have made it to the summit! Tired Nat at the summit. The weather cleared up on the way back down, and the views started to open up. By the time we reached the bottom, I was feeling well enough to eat a late lunch. Again, it wasn't the most comfortable day out, but it was an immensely rewarding one. 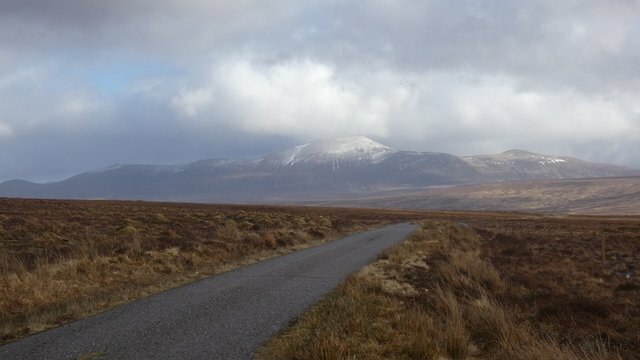 On the way back to the Crask Inn, we were treated to more dramatic views of Ben Klibreck, another Munro that we were planning to climb the next day. I had reservations about this, because I'd seen the weather forecast, and it was not looking good. My friends waved my fears away, saying it would be fine. 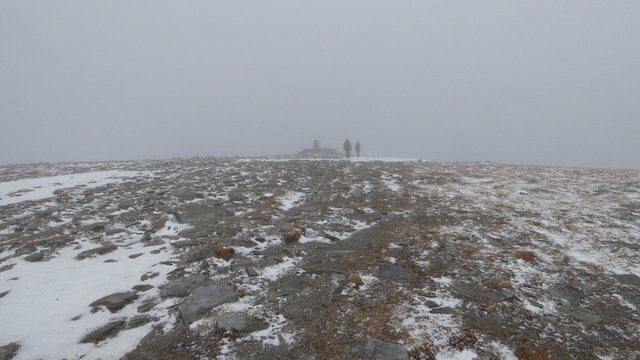 They were determined to climb this mountain, regardless of the weather. By late afternoon, the winds were gusting up to high levels again. I had been planning to get my tent out again, as were Sunny and Iain, but it didn't take much to convince us to keep our cosy hotel rooms on for another night. The next morning, the weather reports were forecasting winds of 55mph, gusting up to 65 on the summits. I didn't think this was safe on a mountain with exposed ridges. The others disagreed with me, saying that the ridge was protected for most of the way. But there was still one exposed section – not to mention the summit cone, which seemed pretty exposed! My friends were not to be deterred. Eventually, I said that I'd stay at the hotel and read my book. I was still feeling a bit tired. 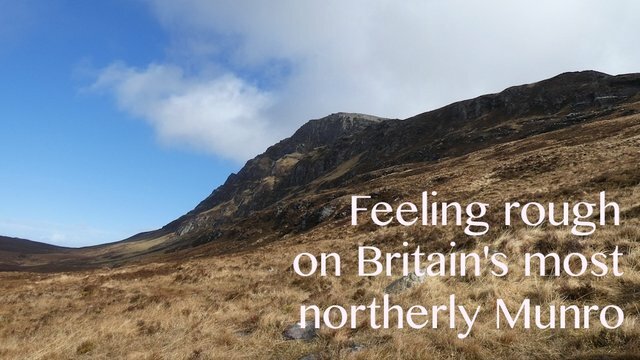 My friend Karen reminded me that the Scottish weather can be very changeable, and I thought about the number of times I've had a fantastic day on the hills, despite a terrible morning weather forecast. 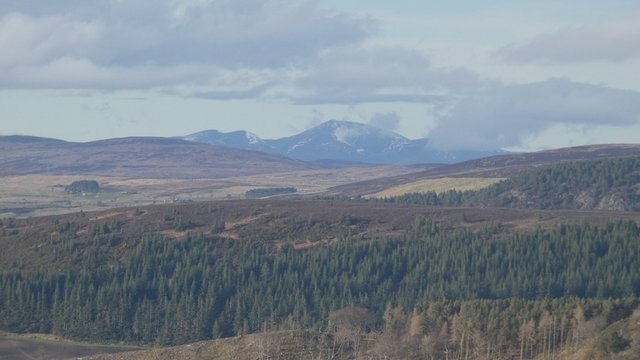 Close-up of Ben Klibreck from Struie Hill. I don't have any idea how this turns out (I have a pretty good clue that it wasn't THAT bad as you are writing it) but when that little voice tells me it's not a good day to ride, I don't. I do not care what friends might say, I do not care what I might miss. I have way too many dead friends that didn't listen to the voice. I love your writing and I love the doing of this deal. Very cool. Thank you for it. We live in a totally different world @natubat I don't think I could survive your journeys over those hills and mountain tracts. It is a different world in those mountains! Nothing much survives up there, but it is an incredible atmosphere.